Is there anything better along-side some good barbecue or beef stew than a thick slab of warm cornbread, slathered with fresh butter? I’m going to guess the only thing might just be this maple cornbread. I’ve been on a bit of a maple kick in recent weeks, well, a) because I am SO ready for Fall and Maple is just an autumnal flavor, but b) because one of my favorite Canadians ever, Aimee from Simple Bites, brought me pretty much a metric ton of Maple products when she came to visit in late July. There’s just something really great about a Canadian friend on your doorstep bearing Maple sugar and syrup, I assure you! Maple syrup highlights the natural sweetness of corn in this bread without making it over-the-top, dessert-like sweet. When you add a little salted butter on top, it becomes that perfect combination of salty-sweet that makes your taste buds sing. Some people say Southern people don’t like sweet cornbread, but I think that’s hogwash (or hogwarsh, as Nanny would have said). We like it plenty. 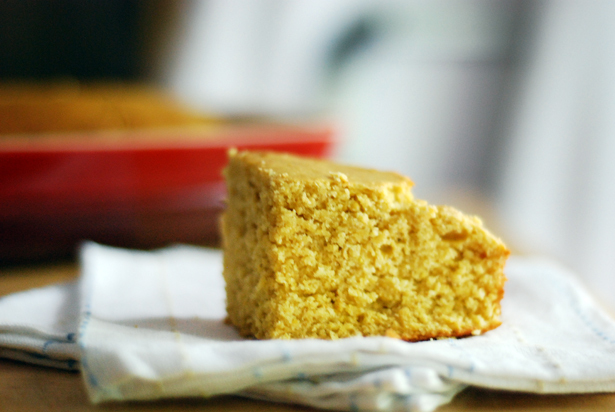 One of the things I love about a simple cornbread is how versatile it can be. You can bake it in whole pans, like I did for this recipe, or you can bake it in individual muffin tins for easy serving and freezing. 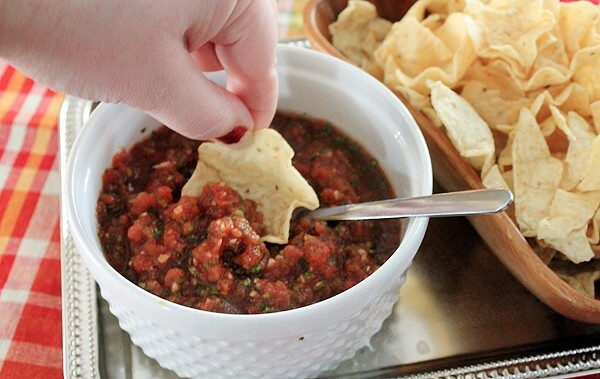 You can add cheese, jalapenos, or even a can of fresh corn to liven up the texture. Or you can leave it simple. Later this week, I’m going to show you a fun breakfast recipe using cornbread muffins that just might knock your socks off. You can use this recipe, or you can simply go with a box of Jiffy mix. But if you’re really after something special, make this recipe. It’s no harder to put together than the Jiffy box anyway! Spray muffin tin or small casserole dish (8×8 or 10×7) with cooking spray and set aside. In a separate small bowl, add milk, maple syrup, and eggs. Whisk together until completely combined. Melt butter and allow to cool slightly so that it won’t cook the eggs in the mixture, then add to the wet ingredients and whisk again. Pour the batter into your chosen pan and then bake for 22-27 minutes, until golden brown. When pierced with a toothpick, the toothpick should come out cleanly. Real Simple has this recipe in this month’s issue. It was wonderful cornbread. Your recipe is great if you don’t want to make a 9×13 pan of cornbread! Thanks for sharing. You’ve given me a bright idea what to do on our backyard corn. Alora’s been asking me to make cornbread because it’s her “favvvvvoorrrriiiteeeee”. Now I want some too. With beans like Aimee said – a whole vat! Darn it! My daughter has been begging me to make cornbread. Now that I’ve seen this I kindasortahaveto make it. Yes. What a classic southern treat! Love this. LOVE this!! We drizzle maple syrup on our cornbread anyway, so why not mix it it?? I’m thinking about this and your special bean dish. Match made in heaven?? For sure. It would be *great* with borracho beans. 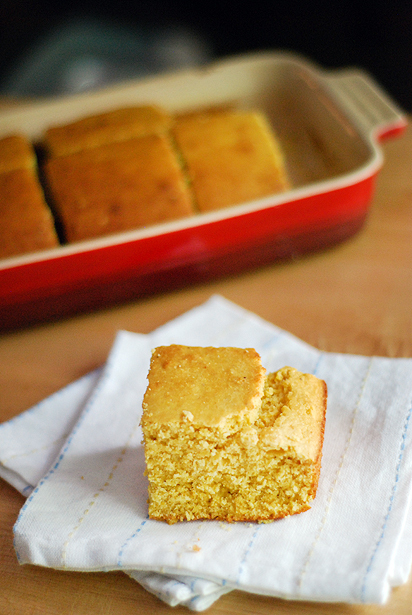 Tasty twist on cornbread-bookmarked. I have some maple syrup waiting to be used. This is a winner-buzz. 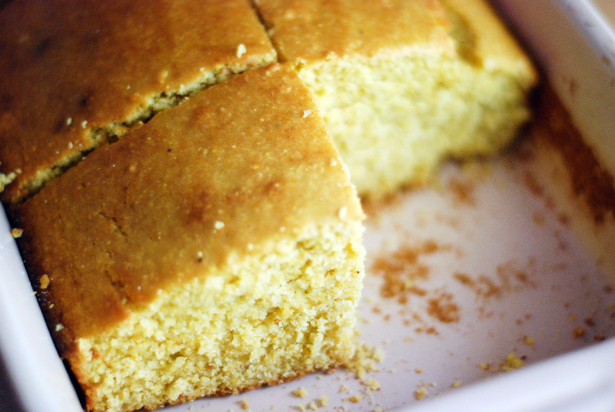 Yes to sweet cornbread! I usually slather mine with butter and honey (or honey butter) but I love that you baked the maple right in. We always slathered ours with honey butter when I was growing up, and it would be perfect on this maple version. I definitely think Canada and Vermont have the best maple syrup. Aimee was so kind to bring me all that syrup and maple sugar. And Apple Cider Ice Wine! Ooooh Tracy, you just made me think of mini cornbread muffins. Can you imagine how poppable they’d be? You could even drop them in soup like dumplings..